Holi ! – Trippin' Thru! 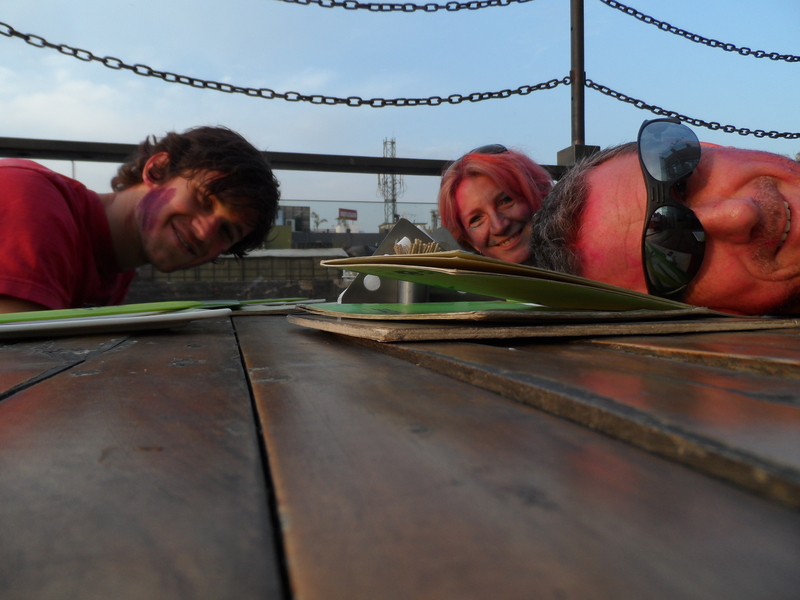 From the Diary, North India in 23 Days, Visting India? Sitting down for breakfast we were joined by a Swiss couple who looked like they’d been in a road accident – and indeed they had. 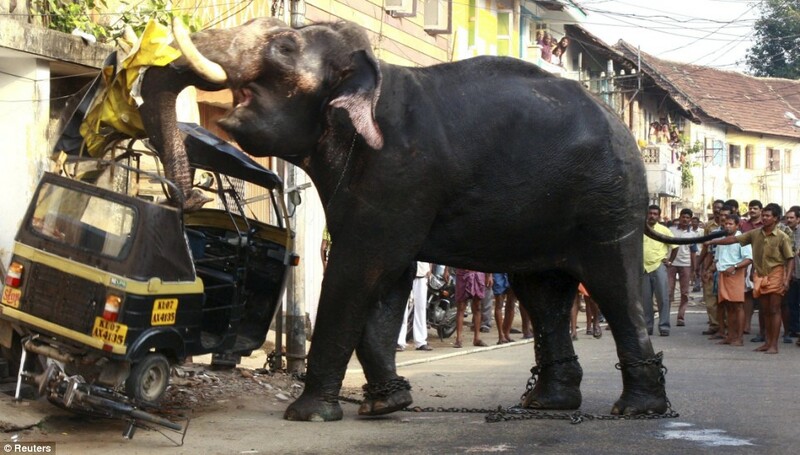 The night before, the tuk tuk they’d been riding in had been hit, side on by a car throwing both of them from the rickshaw and subsequently being ambulanced to hospital. They checked themselves out though because the amount of ‘carnage’ that was coming in to the A&E from road accidents made their injuries seem trivial (gashed forehead on him, possible dislocated shoulder on her). Despite what the taxi, coach and tuk drivers tell you, India has the highest road death rates in the world. In fact it is safer to base jump. 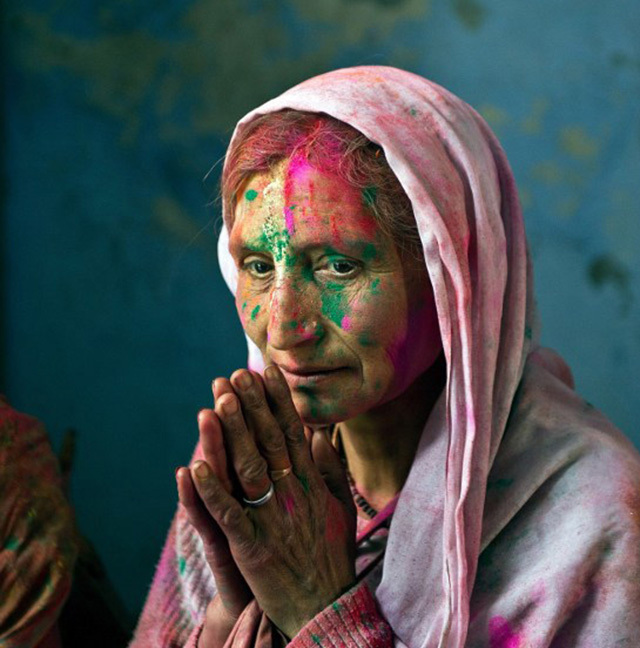 It was then that Ashwari, the hotel owner, came in to the dining room brandishing pink paint powder and so it was that we were all facially colored before even leaving the breakfast table so my holi festival avoidance tactics had hiccuped at not even the sight of a first hurdle. 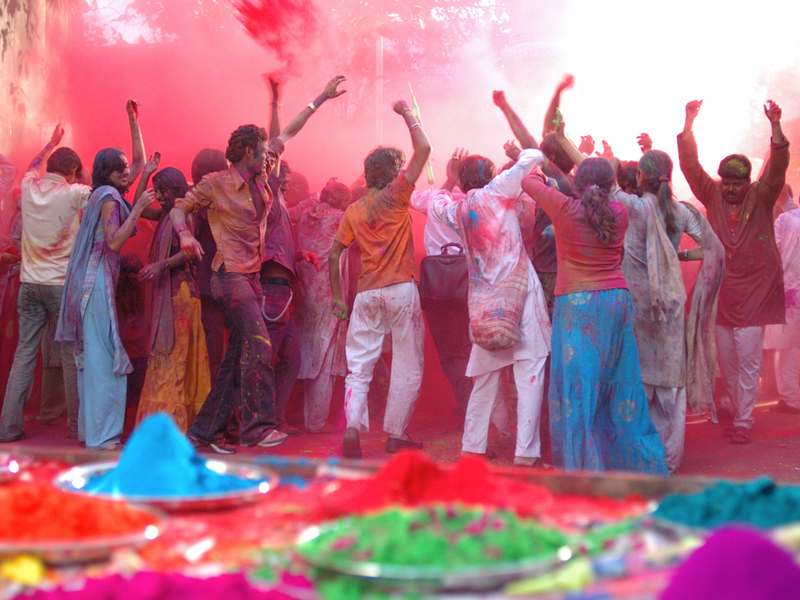 Holi is a spring festival also known as the festival of colours or the festival of love. It is an ancient Hindu religious festival that has become popular with non-Hindus as well. It is primarily observed in India, Nepal, and other regions of the world with significant populations with people of Indian origin. Recently, the fesitval spread to parts of Europe and North America as a spring celebration of love and colors. We left the hotel to walk to the one open shop that sold water and was immediately in a movie scene from Black Hawk Down. In that film the US soldiers had to run a guantlet of bullets through the streets of the Somali capital of Mogadishu whilst we, it very quickly transpired had to walk a gauntlet of paint bombs through the streets of a quiet neighbourhood suburb of Delhi. They were coming at us from all angles from rooftops, from the windows of every floor on every house, from passing motorbikes where one bike with three people on it all managed a synchronized bombing whilst moving. By the time we had reached the end of this one, quiet mind, street we looked like we’d survived an explosion at a Dulux factory. 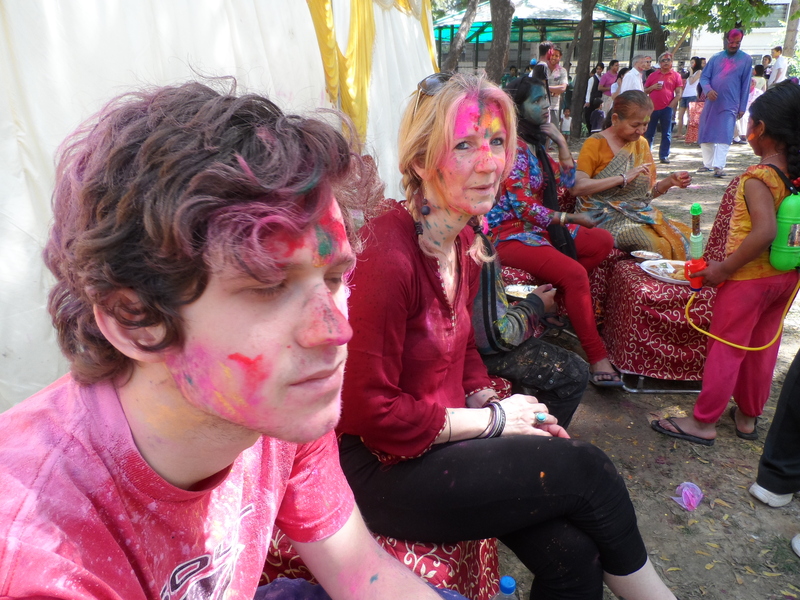 My Holi avoidance tactics had clearly failed. The next street and the one after that was no different. It had obviously gone along the wires that they’re were westerners coming and we were met at every nook and crannie. 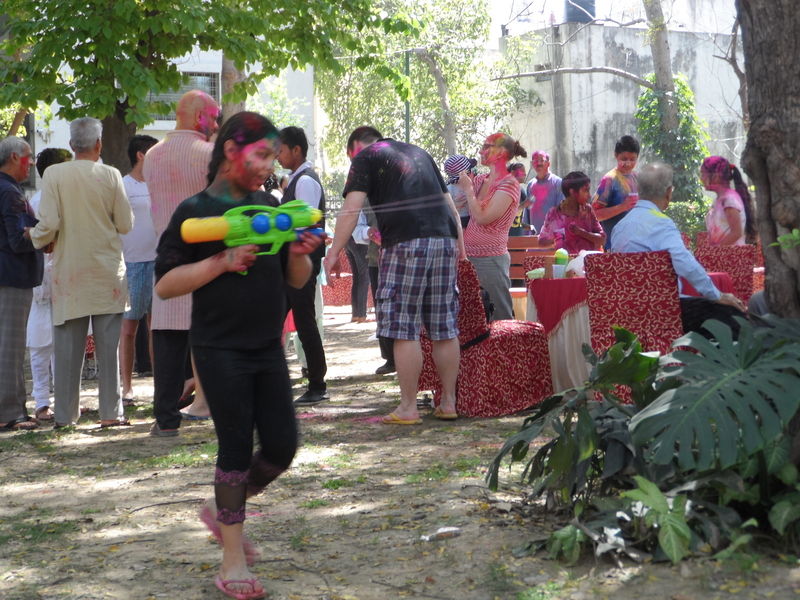 We happened upon a park where the locals of Saket were having a community Holi party – big buffet, DJ’s and bollywood dancing and we were invited in and it was insisted that we ate and danced. Indians definitely dance differently. They make all westerners who dance, regardless of any past Ibiza credentiials, look like your father in law after five pints at a bad disco. Then there was a sort of undercover finale where lots of little plastic bottles, full of vodka were handed out and we were also encouraged to take part. It was a lovely time and after the vodka, it felt like we lived in this suburb of Delhi as we’d got to know so many of the residents and them us. One Love. Sitting in quiet, cool, reserved Pacific NW, and looking at those paint bomb photos, thinking (OK, ‘fess up) thinking, what a mess! Mud pie for all ages! Pretty funny about the vodka, and your description of westerners trying to dance. Hope your friend is still your friend after the phone smash. Happy holi!